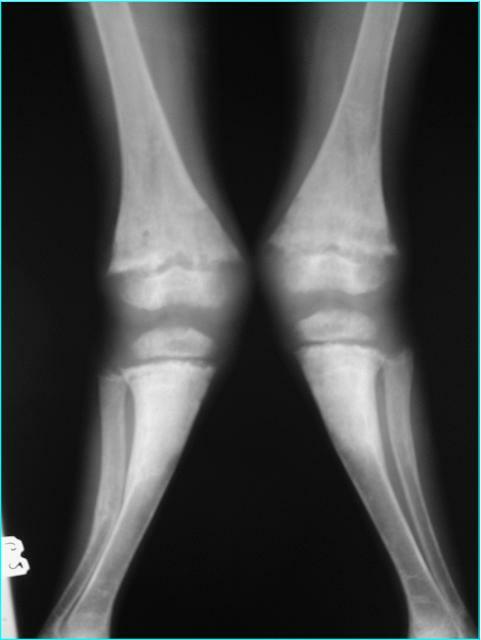 Genu valgum is a normal developmental variation. At birth, the knee is usually in a bowlegged posture (genu varum). By age 2 the angle of the upper leg bone relative to the lower leg bone starts to straighten. The knee then goes into a knock-kneed posture progressively until it maximizes at approximately age 4. The knock-kneed appearance then lessens into a more adult value by age 10-12. The distance between the bones on the inside of the ankle is measured (intermalleolar distance). 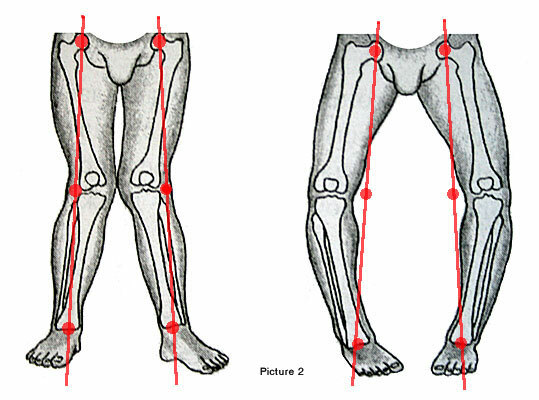 At age one the distance between the inner aspects of the knees is approximately 0 and the distance between the inner ankle bones (intermalleolar distance) is approximately 2 cm. By age 3-4 it is approximately 4 cm and slightly decreases into adulthood. X-rays may also be taken of the entire lower extremity and the angle made of the upper leg bone relative to the lower leg bone is evaluated. At birth, the angle is towards a bowlegged appearance. The angle approaches neutral (0 degrees) by approximately age 2. By age 3-4 it is approximately 4 cm, slightly decreases into adulthood. If intermalleolar distance can be considered within normal limits up to 8 cm between the ages of 2 and 11. Genu valgum is often associated with a flatfoot deformity. When the knees are in an excessive knock-kneed posture the joints in the foot (subtalar joint) have to rotate out. This puts excessive stress and strain on the ligaments, tendons and soft tissue in the inner arch and ankle area. Children that are excessively knock-kneed and flatfooted run very poorly and generally lack coordination relative to their peers. They fatigue prematurely with activity and do not participate in sports at the level of their peers. Knee problems are very common in children that are knock-kneed. Malalignment of the patellofemoral joint is commonly seen, creating an imbalance. Abnormal tracking of the patella (kneecap) in its groove may predispose it to chondromalacia, patellar subluxation. Also associated with excessive knock-knee is excess stress to the inner aspect of the upper and lower leg bone (medial tibial stress syndrome). This is commonly referred to as shin splints. As an adult, excessive knock-knees are associated with premature wear of the cartilage on the outside of the knee joint, causing arthritis to take place. Evaluation of the entire lower extremity is important. Any associated problems including flatfeet must be addressed. Flatfeet can be addressed by placing an orthotic in a shoe. This will prevent the arch from increased stress and the potential for further breakdown. It would also help the child’s gait improve and lessen the fatigue that may be associated with the deformity. An overweight child can also attempt to lose weight to unload the knee. It is best to place him on exercises that do not stress the knee. Swimming and cycling seem to be best. Bracing of the knee may provide some benefit, especially if the knee clinically and the angles seen on x-ray appear to be abnormally high. Some conditions may predispose a child to be knock-kneed. The most common is a fracture that occurred in the upper portion of the lower leg bone (proximal metaphysical tibial fracture). This has a tendency to allow the leg to drift into a valgus posture. Metabolic disturbances (hypophosphatemic rickets), multiple epiphyseal dysplasia and pseudoachondroplasia must also be ruled out via x-rays. Below is an illustration comparing genu valgum (knock knee) on the left to genu varum (bowleg) on the right.